The Republican and Democratic National Conventions have given us two straight weeks of chanting, championing causes, and Chachi, as a steady wave of celebrities on both sides of the aisle (but mostly the left) have come forward to throw their support behind their candidate of choice. 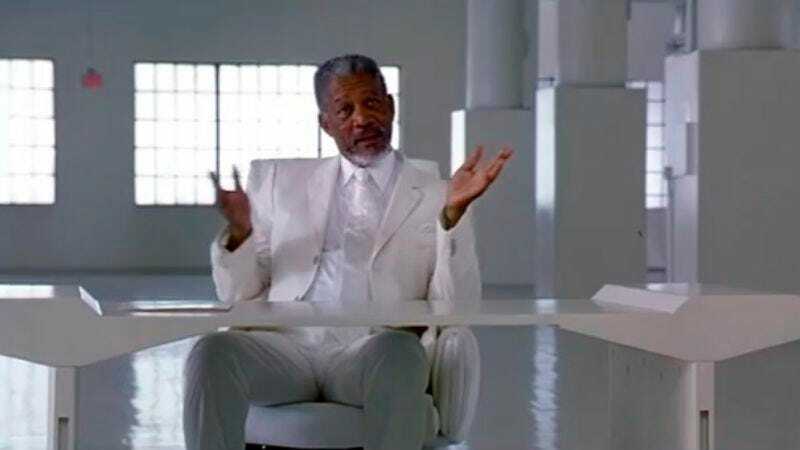 But tonight, the campaign for Hillary Clinton pulled out the biggest, deepest gun of all: God himself, Morgan Freeman, who attempted to use his quasi-magical vocal powers to narrate his chosen candidate directly to the top of the United States’ executive branch, as deftly as he once made all those penguins march. Freeman didn’t appear in the flesh—presumably wracked by years of exposure to the waves of bass and sincerity that flow out every time he opens his mouth—but his voice appeared on a 12-minute video produced by Scandal and Grey’s Anatomy creator Shonda Rhimes, attempting to make HRC her latest sure-fire hit. The video—featuring appearances by President Barack Obama, potential First Husband Bill, and the requisite 9/11 survivors and first-responders, was produced by Rhimes and her long-time Shondaland collaborator, Betsy Beers. Freeman’s wasn’t the only powerful voice to make an appearance at tonight’s climax to the DNC; Katy Perry was also there to sing “Rise” and “Roar” to an eagerly waiting crowd. (Meanwhile, Clinton reportedly had to raise her own voice a bit, as well, in order to be heard over occasional bouts of protest and support as she accepted her party’s nomination.) Anyway, now we’re imagining Morgan Freeman singing “Roar,” which is hopefully the sort of mental audio snapshot that’ll bring us some measure of comfort now that the conventions are over, and the ugliest, bloodiest part of the upcoming presidential election has begun.